If you tuned in to my free webinar, “Moving Data with Azure Data Factory,” on Tuesday, 26 Mar 2019 and could not connect, I sincerely apologize. I moved the webinar to Monday, 25 Mar 2019 due to a scheduling conflict. I recorded it and you may view the webinar above. Enterprise Data & Analytics‘ data engineers are experts at lifting and shifting SSIS to Azure Data Factory SSIS Integration Runtime. Our state-of-the-art DILM Suite tools in the capable hands of our experienced data engineers combine to drastically reduce the amount of time to manually migrate and apply SSIS Catalog configuration artifacts – Literals, Catalog Environments and Catalog Environment Variables, References, and Reference Mappings – while simultaneously improving the quality of the migration effort. Check out our Lift and Shift page to learn more! Last night I presented Moving Data with Azure Data Factory to a packed house at the Richmond Azure User Group. The crowd was engaged and asked awesome questions. I had a blast! When I clicked on the Settings tab I found new stuff – options I’d not previously encountered. Thankfully, I immediately recognized the purpose of these new configuration options – and I also immediately liked them. The demo worked and no one was the wiser (except the handful of folks with whom I shared this story after the meeting). The new interface sports new dropdowns for selecting the Catalog Folder, Project, and Package to executed. I like this – it’s slick. 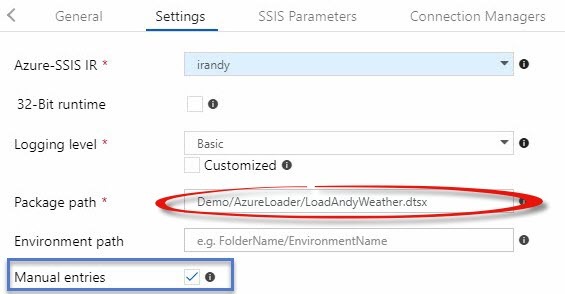 I had deployed a project to my Azure-SSIS instance between the time I started this part of the demo and the time I wanted to configure the Execute SSIS Package activity. During deployment I created a new Catalog Folder which was not initially listed in the Folder dropdown. Clicking the Refresh button remedied this, though, and I was able to complete configuration rapidly. 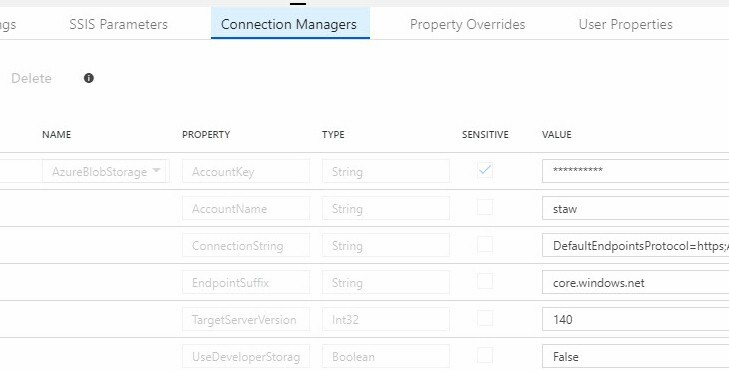 I cannot recall if the Connection Managers and Property Overrides tabs were part of the previous Execute SSIS Package activity interface. I don’t think so, but I could be wrong about that. Update: I verified these are new tabs by looking at screenshots from my June 2018 post titled ADF Execute SSIS Package Activity. The previous version had an Advanced tab. 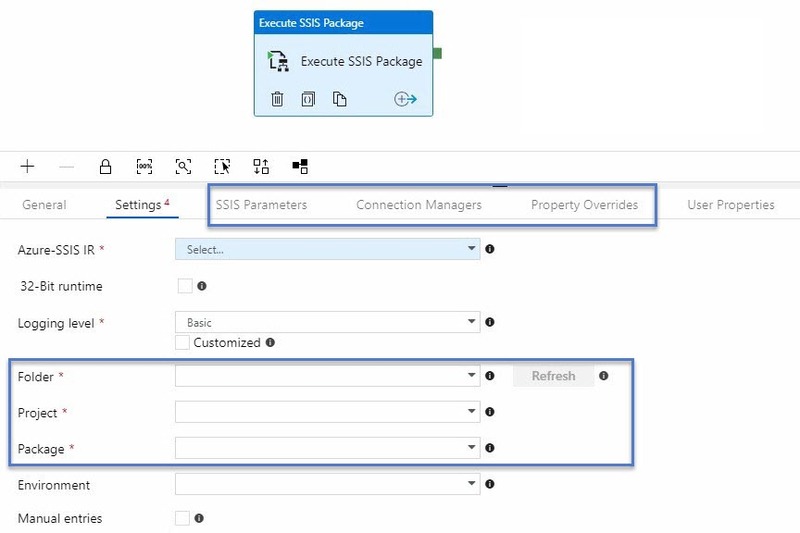 The SSIS package configuration tabs are SSIS Parameters, Connection Managers, and Property Overrides. It’s possible to configure the Execute SSIS Package activity when your Azure-SSIS Integration Runtime is not running, but you don’t get the nice dropdown pre-population and have to revert to the previous method of configuring the full SSIS Catalog path to the package you desire to execute. 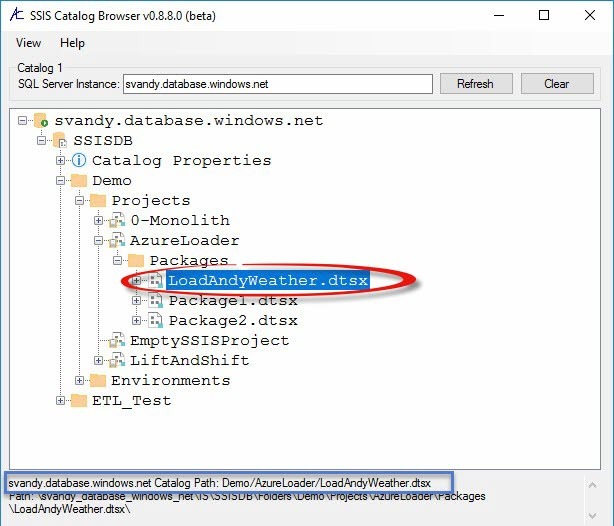 SSIS Catalog Browser To The Rescue! Make sure the Manual Entries checkbox is checked. I like the warnings. Feedback is a good thing. Microsoft Azure is evolving at a rapid rate – especially Azure Data Factory! Presenting Moving Data with Azure Data Factory in Richmond 7 Feb! I’m honored to deliver Moving Data with Azure Data Factory to Azure Richmond Virginia Thursday, 7 Feb 2019 starting at 6:30 PM! The meeting will be held at Markel Plaza – 4600 Cox Road · Glen Allen, VA.
Join me For Expert SSIS Training! 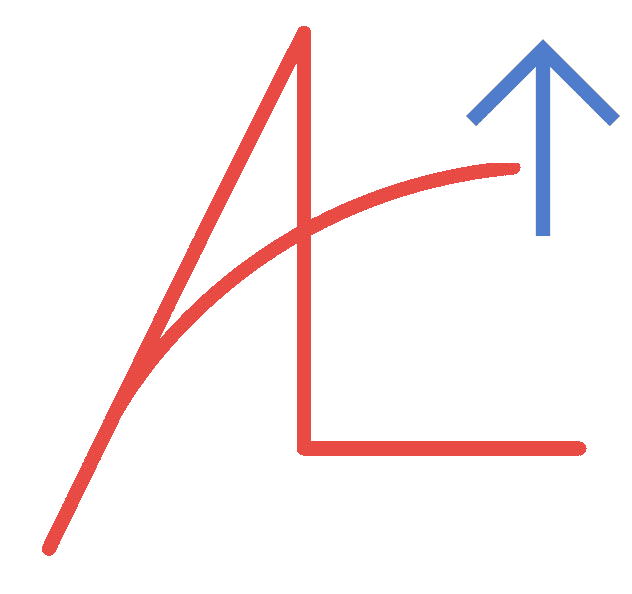 I’m honored to announce Expert SSIS – a course from Enterprise Data & Analytics! The next delivery is 01-02 Apr 2019, 9:00 AM – 4:30 PM ET. 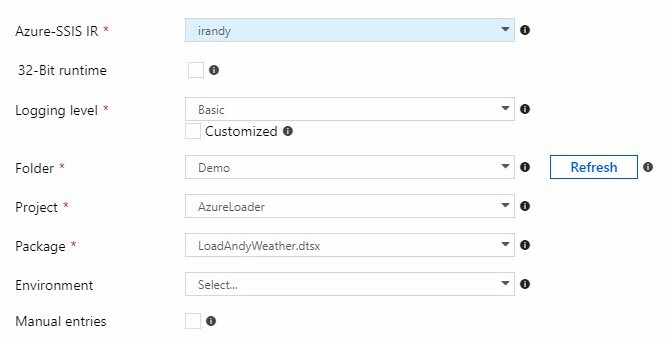 PS – Want to Learn More About Azure Data Factory? 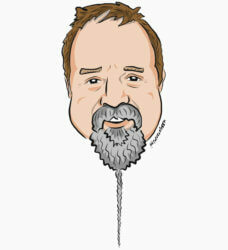 Follow Andy Leonard’s SSIS Training page for more information. Want to Learn More About Azure Data Factory? I am honored to announce Fundamentals of Azure Data Factory – a course from Enterprise Data & Analytics! The next delivery is 04 Mar 2019, 9:00 AM – 4:30 PM ET. PS – Join me For Expert SSIS Training! I’ve been making smaller, more incremental changes to SSIS Catalog Browser – a free utility from the Data Integration Lifecycle Management suite (DILM Suite). You can use SSIS Catalog Browser to view SSIS Catalog contents on a unified surface. 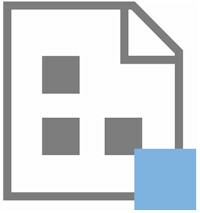 Catalog Browser works with SSIS Catalogs on-premises and Azure Data Factory SSIS Integration Runtime, or Azure SSIS. It’s pretty cool and the price ($0 USD) is right! The latest change is a version check that offers to send you to the page to download an update. You will find this change starting with version 0.7.7.0. Version 0.7.8.0 includes a slightly better-formatted version-check message. As I said, smaller, more incremental changes.